dsjv :: Deep South Jewish Voice: Nation File :: A High-Stakes G.A. Nation File :: A High-Stakes G.A. 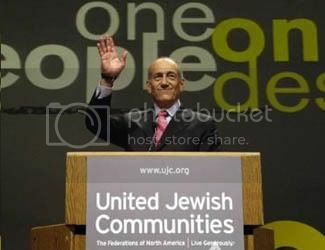 Israeli Prime Minister Ehud Olmert addresses the UJC General Assembly. LOS ANGELES, Nov. 15 (JTA) — The United Jewish Communities’ annual General Assembly usually is seen as something of a pep rally for the lay and professional leaders on the ground in the federation system. But this year’s G.A., which started Sunday at the Los Angeles Convention Center and wrapped up Wednesday, was a higher-stakes affair. In the midst of an Israel Emergency Campaign that so far has raised roughly $348 million to help rebuild Israel after the summer’s war with Hezbollah in Lebanon — and coming off a couple of General Assemblies that by many accounts fell flat — the UJC saw this one as an important momentum builder. The organization revamped its program only 10 weeks before the gathering, from one that would have highlighted major federation contributors and professionals to one that was primarily Israel-centric. UJC President and CEO Howard Rieger told a news conference of Jewish journalists Monday that response to the original-themed event had been disappointing, but in the end, some 5,000 federation and Jewish communal professional and lay leaders turned up for the G.A. The UJC might have abandoned its Hollywood theme, but its opening plenary still had plenty of showman’s flair. The program was marked by interludes from Dan Gordon, who wrote the acclaimed 1999 film “The Hurricane” and decided to serve as a reservist in the Israeli army during its recent war in Lebanon. It also featured a spoken-word and musical performance arranged by avant-garde Jewish musician Craig Taubman, performances by musician Debbie Friedman and a reading by actor Jon Voigt. Theatrics aside, the plenary sessions offered a hardhitting array of speakers, among them six high-ranking Israeli government officials, highlighted by a Tuesday night address by Prime Minister Ehud Olmert. Olmert did mention that he’d be willing to sit down with Palestinian Authority President Mahmoud Abbas at any time, but he spent much of his time thanking UJC and its leaders for helping to rebuild Israel’s North after the war. Bielski later explained that the comment was intended to highlight the importance of aliyah. Israeli opposition leader Benjamin Netanyahu used one plenary to lay out what he calls Iran’s “single-bomb theory” — taking care of its “Jewish problem” by attacking Israel with a nuclear weapon — as the first stage in a broader nuclear attack on the Western world. “This is 1938, Iran is Germany. And Iran is racing to get atomic weapons,” Netanyahu repeated almost as a mantra during his speech. On Monday, Israeli Foreign Minister Tzipi Livni told reporters that the Israeli people are frustrated because many assumed that attacking Hezbollah would lead to the return of two soldiers Hezbollah captured in a July 12 cross-border raid that sparked the conflict. And there were some unlikely meetings of the minds, such as a plenary Monday at which Rabbi Norman Cohen, provost of the Reform Hebrew Union College-Jewish Institute for Religion; Arnold Eisen, chancellor-elect of the Conservative Jewish Theological Seminary; and Richard Joel, president of Orthodox Yeshiva University, discussed how to engage young people. Most in attendance, such as Avi Naiman, chairman of the UJA Federation of Northern New Jersey’s Israel and Overseas Committee, felt the shift to a more Israel-centric program was important after the war. “To focus on something aside from Israel would have been inappropriate,” he said. Naiman felt the G.A. was informative, but should have provided more tools and workshops showcasing successful models for federations to take back to their own communities. “Now we have to figure out what the next step is,” he said. Making the G.A. less of a “one-way affair” is something that UJC “will have to work on,” he said. Still, the collection of people at the G.A. was “very valuable” he said, and it provided delegates from his federation with an opportunity to meet face-to-face with many of the professionals they have been working with to help his federation’s sister city, Nahariya. Each year, the G.A. is a place where Jews from all walks of the federation and Jewish communal system can come together — from those such as Scott-Martin Kosofsky, who came to meet with people involved in the production of his upcoming book, a reproduction of the 1940 Arthur Szyk Haggadah, that will sell for $6,000-$25,000 per copy; to those such as student Alex Friedman, president of the Hillel chapter at Washington University in St. Louis. But the biggest business happens between the sessions and plenaries, where federation leaders and volunteers can bounce ideas off each other and where those looking for funding can schmooze with potential benefactors. Take, for example, Mark Levenson, president of the UJA Federation of Clifton-Passaic in New Jersey. His small federation, which has an annual campaign of less than $1 million, is on the verge of merging with a much larger federation, UJA Federation of MetroWest New Jersey. The conversations that planted the seeds for the shidduch took place while walking in Jerusalem between sessions at the 2003 G.A., Levenson said. “I almost did not want to come back to the G.A. because the first one I went to in Cleveland was so bad,” said Marlene Lauwasser, campaign president of the Milwaukee Jewish Federation. But she said she was glad that she had decided to attend this year’s event with seven other members from Milwaukee because it had been invigorating. “I’m just so proud to be Jewish, and to be in a room with 5,000 Jews is amazing,” she said. This year, for the first time, the UJC held a lunch for 250 federation executives, Rieger told JTA. But the question now is what the federation representatives will do with the material the G.A. provided. One goal is to continue the Israel Emergency Campaign. Though the G.A.’s goal isn’t fund raising, the themes that delegates take from the meeting should play out in the work they do in their home communities, said Steve Nasatir, president of the Jewish United Fund/United Federation of Metropolitan Chicago. The G.A. “transcends just the raising of dollars,” Nasatir said, but added that he hopes the emergency campaign can raise another $100 million. The Chicago drive has raised $40 million for the emergency campaign — $32 million of which came in the first week — and it’s pushing to raise more. The UJC faces two major challenges in coming months, Rieger said. The first is making as big an impact as possible in terms of getting out the message about important Jewish needs — and “that’s not all about money,” he said. The second is trying to figure out how to build a bigger donor base. But all in all, he said, he was pleased with this year’s G.A.